delicious. editor Karen Barnes’s late mum used to make this decadent starter on special occasions, and now Karen makes them regularly. Why? “Because they taste wonderful, they take about 20 minutes to prep and (best of all) you can make the whole thing ahead, then leave the little dishes in the fridge ready to flash through the oven just before everyone sits at the table. That’s my kind of cooking,” she says. Heat the oven to 180°C/160°C fan/gas 4. Melt the butter in a large heavy-based frying pan over a medium-high heat. Add the halved button mushrooms and fry for 10-12 minutes, tossing them around the pan, until golden and starting to soften. Season well with salt and pepper, add the garlic and fry for 2-3 minutes more. Stir in most of the chopped parsley, then divide the mushroom and garlic mixture equally among the 6 ramekins. Set the ramekins aside to cool. Whisk the crème fraîche and cream cheese together in a small mixing bowl, then dollop evenly over each ramekin. 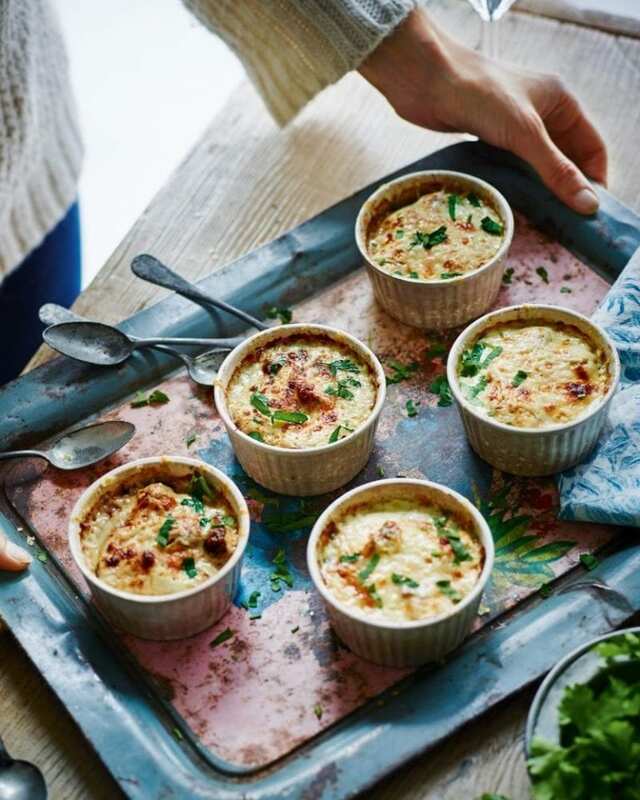 Grate the parmesan (or other cheese) over, then put the ramekins on a baking tray. Transfer the tray to the oven and bake the mushrooms for 15 minutes until bubbling and starting to turn a bit golden on top. Scatter with the remaining chopped parsley and serve straightaway, with small hunks of crusty bread on the side to dip into the cooking juices. It’s best not to use big field mushrooms as they release too much dark juice and make the finished result a bit grey. Use closed-cup mushrooms or chestnut mushrooms. Next time, try swapping the parsley for thyme and try different cheeses, too – the recipe would work brilliantly with a mix of blue cheese and cheddar instead of the parmesan, and feta would be good as well. Prepare until ready to bake (the end of step 2), then cover and chill in the fridge for up to 24 hours. Cook straight from the fridge, adding 3 minutes to the oven time. I want to make these as a side dish for a BBQ . Could I bake them in one dish and would that increase the cooking time?